Bangalore/ National, 2nd Aug 2017: They are fun, they are irresistible and they are now in India! This morning, M&M’s® took Maximum City by storm and oh boy, what a grand filmy entry. Mr. Red and Mr. Yellow scootered down the iconic Gateway of India, in true Bollywood style, channeling their own Sholay moment a la Jai and Veeru, leaving the crowd ecstatic. M&M’s® is all about its iconic characters and their witty humour – and that’s precisely why, Mr. Red and Mr. Yellow represent all that is smart and witty, innocent and simple in the world of M&M’s ®. 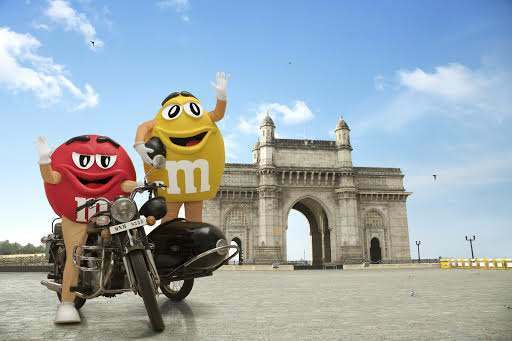 Globally known for their camaraderie and friendly banter, the Red and Yellow M&M’s® were in Mumbai to share happiness and spread joy in their unique style! This explains their fun spin on everyone’s favorite film – posing at the picturesque Gateway of India. What’s more? They were even spotted carrying some Bollywood inspired goodie boxes to a wide section of chocolate lovers! M&M's®, as we know them “melt in your mouth and not in your hands”, and now they are here to add zing in your life and brighten up your day. Now available in India in two variants – Chocolate and Peanut, M&M's® will come in two shareable sizes of 45 gm pack and 100 gm pack, priced at INR 80 and INR 150 respectively. For more information about Mars, please visit www.mars.com.